kelbysews: A Pattern, A Freebie, and A Giveaway! A Pattern, A Freebie, and A Giveaway! Neato, right?!?!? Ali is the PDF goddess behind all my beautiful color images! Please note, there are no instructions on HOW to paper piece in general with my pattern. I'm assuming you guys know what to do and can follow the numbers on the pattern. Now, on to the freebie! While you can purchase the entire alphabet pattern in my etsy shop, I'm giving you guys these four letters for free! Numbers followed by a "(b)" indicate where you should use background fabric. If anyone has issues with the Scrib PDF, let me know, I'm newbie at including PDFs in my blog! You should just be able to click on "Download" below to get the free letters. If you're having problems downloading the letters, you can also get them on Sew Mama Sew's webistie HERE along with a paper piecing tutorial. Now, are you ready for the fun part? I'm going to give away one copy of my new pattern AND this little mini I made last night, entirely from Flea Market Fancy! I shrunk the letters down 50% for this little guy who measures 6.5"x18". 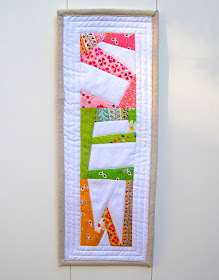 Think of how cute something like this would be for a kiddo's room or a nursery with the letters of their name! So up to three comments per person. All non-reply blogger comments will be deleted unless you leave your email address in the comment! I will leave the giveaway open until 11pm (CST) Sunday, November 20th. I will announce the two winners on Monday, November 21st with the help of Mr. RNG. Yippee!!! I've been on the edge of my seat waiting for the pattern. so cute! is that Essex linen binding? *love* I'm crossing fingers and toes. These are adorable, Kel. Well done. Wonderful job on the new patterns girl! You are sew talented and sew productive and I sew hope I win! whoa! I've been wanting to make a project with letters, but have been too lazy to draw them out :) this is awesome! how do we download the pdf without a scribd account? Yeah just bought the full pattern, now off to print out the J, A, C, K.
great looking pattern kelly! 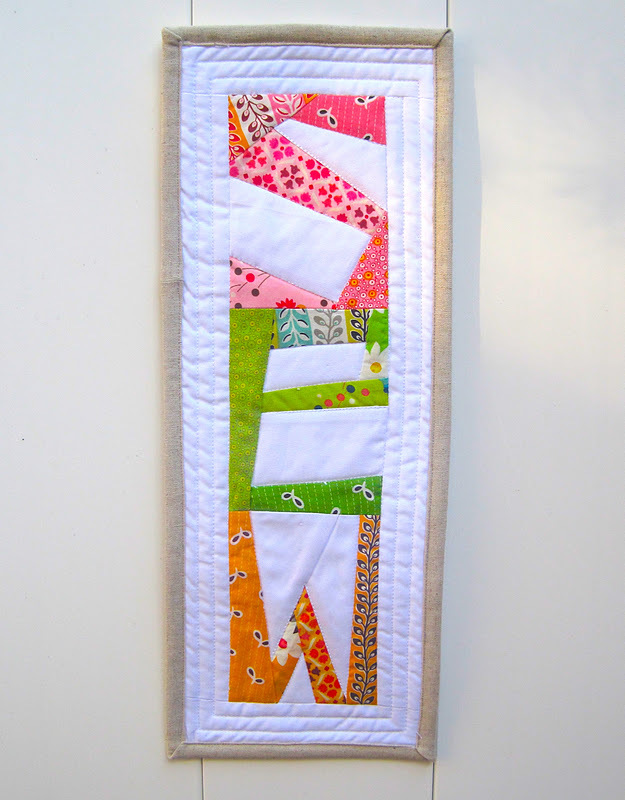 ive been thinking alot about using some letters/words/dates in my quilts lately! job well done! What fun - thank you! I'm going to have a go at making the free letters first! Awesome giveaway by the way!! How do you get a peanut to laugh? great pattern! thanks for the chance to win. of course, the only thing i can think of spelling out is inappropriate as my toddler wanders freely upstairs refusing to nap. ;) i'll wait for better inspiration. sometimes i watch birds and think to myself... if i could fly who would i crap on. Super cute! Such a fun addition to a quilt. I'm so proud of you Kelly! 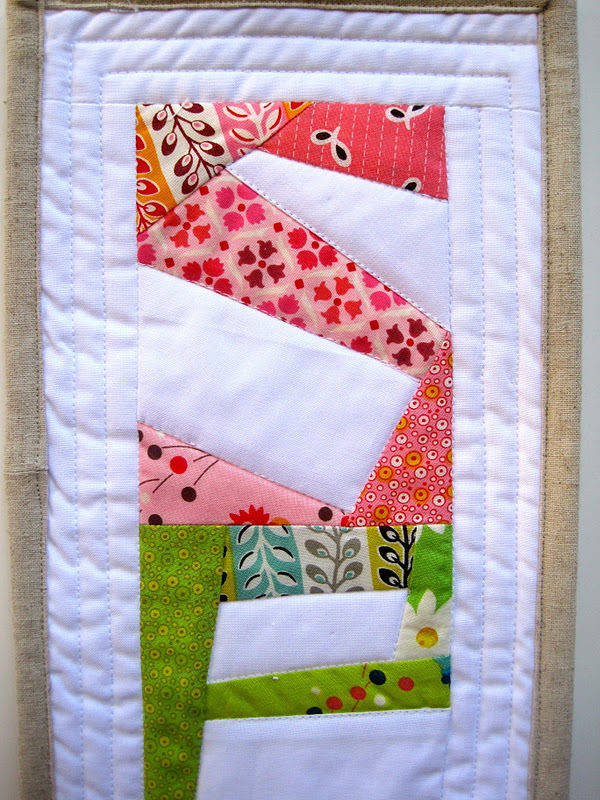 And I LOVE the mini quilt. So exciting! Great job! Thanks for the freebie; I've been wanting to try paper piecing. I retweeted your tweet! 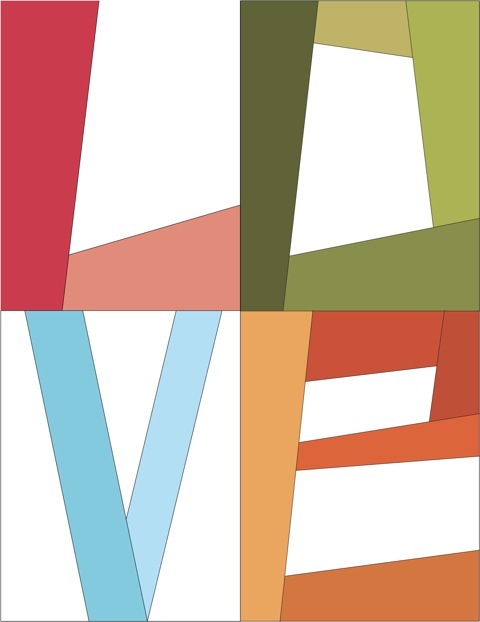 I can't wait to see everyone's wonky letter projects start popping up on Flickr! I'm trying to think of something funny to say, but my mind is clouded up with an 11 hour time change causing me severe jet-lag! This is amazing! I'm with Jen, I can't wait to see what people do with your pattern! How dare you suggest anything with FMF could go in a child's room!! My kids are already banned from touching anything Echino!! So fun, love the alphabet. Love the love and the wall hanging. It would go sew well in my sewing room. Well, I think it's funny. My walking friend and I are trying something different this winter. We are both nervous walkers. Snow and ice= falls and we don't heal as quickly as you young spring chickens. So 1st time it snowed we decided to try walking the lazy river at our aquatic complex. We walk it backwards. The 1st couple of time around I really struggle to get past the jets and I have to laugh at what I look like, flailing with my arms, bobbing up and down and not going anywhere. It is great exercise and we reward ourselves with a 5 minute soak in the hot tub at the end. An added benefit, we walk faster when we walk on regular ground too, so much less friction! Ooo...love the pattern! I can think of lots of places I'd use this. Right now I am working on Christmas presents: wall hangings, table runners, cosmetic cases, and of course, flannel pjs! Your 'SEW' is just lovely - crossing my fingers and toes and eyes hehe! Well aren't you fancy! I love this, and I'd like the Sew mini to come live with me. Perfect timing my grandson is learning his alphabet, fingers crossed and thanks for the chance to win. Oh these are fab. Um, funny? I'm usually good for a smart-arse comment, but alas, work wore me down today, especially when my boss refused to let me hop on a plane to India to strangle someone - meanie! So cute! I'll buy the pattern for sure, as soon as I have paypal funds. um, AWESOME!!! I could write a book in a quilt with ease now! Or at least my favorite poem! WOOHOO!! totally tweeted my loves for it! That is fabulous! Before long I bet you'll be making tons of quilt patterns and even having your own fabric line. Thanks for the lovely giveaway and the fantastic LOVE freebie that I can't wait to try. Awesome!! SO glad to see your creation! The alphabet is great - what a great idea. Love the look of them. It's hard to believe you haven't been sewing longer!!! I wish I had something funny to say, but alas I am rather dull lately. I love the SEW quilt, to pretty! Your alphabet is pretty awesome too! I just bought your pattern - thanks! Oh my goodness this is "Sew" fun!!! love the letters and already have ideas for them. Amazing! Even though I didn't win your quilt at the Summit I can now make my own! :) Awesomeness! I love your letters; they look great! I announced about your give away and pattern on facebook! Stink (an extremely positive word in our fam)!! That alphabet is so cute and you are a doll for sharing the 'love'. hehehe Hugs! Wow what a very cute pattern! 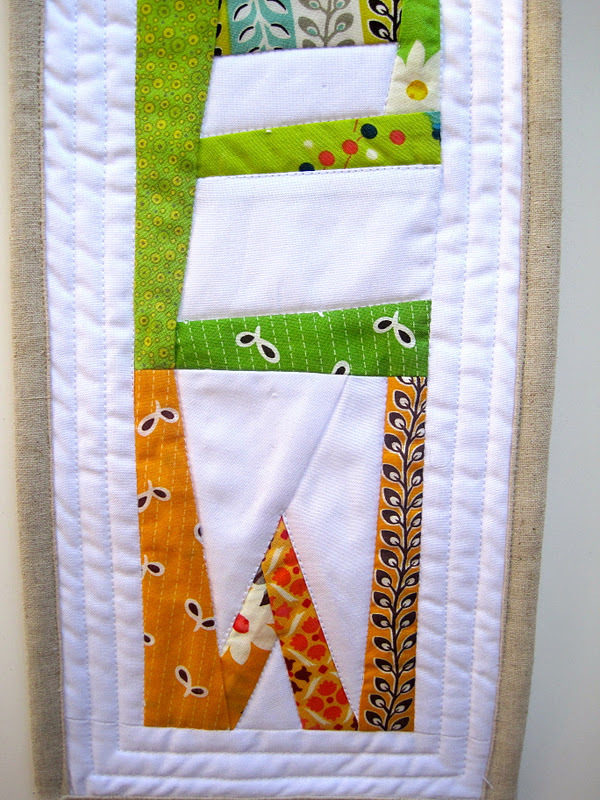 The mini quilt is adorable and would look great in any sewing room :-) Thanks! It looks great Kelly! if I win this I will have to overcome my fear of paperpiecing & give it a try! I love the look! Fabulous! Yes, I have overcome my fear of piecing and I see an alphabet quilt in my future. Thanx! Congratulations! 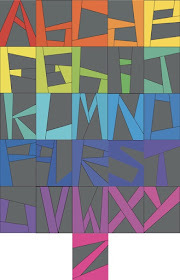 I just love your alphabet - I'm currently working on a word quilt using Denyse Schmidt's proverb templates. I wish I'd started with yours instead as I love the wonky designs of your letters. Thanks for the free LOVE. 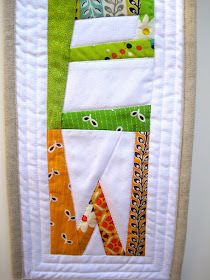 I am smitten by your SEW mini - it would go straight onto my sewing cave door!!! LOVES it! Pick me pick me pick meeeeee! why was the dog sweating? because he was a hot dog! a freebie *and* a giveaway!? wow. haha, I love the comment above mine. I love your alphabet, you did a great job! LOVE! Thanks for sharing with us and what a terrific giveaway! What fun and a freebie too! There's always room for more whimsey in our lives isn't there? I'm new to your blog and have enjoyed reading. Good luck with the new project. Just bought the pattern. So cute! Thank you. Thank you for the chance to win. I love giveaways! Nothing funny, just a compliment on your funky letters - love them! 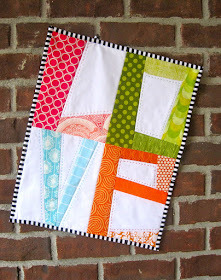 I would love to hang that in my sewing room!